Who doesn't love board games? Classics like Clue, Monopoly, and Sorry were staples in my house growing up. But being an "adult" doesn't mean that I have to give up on my childhood. I've moved on to the likes of Puerto Rico, Settlers of Catan, and Tigris and Euphrates. Still, sometimes it's hard to coordinate schedules to get enough people to sit around a table and play a game, which is why I'm psyched to hear that Xbox Live Arcade is adding three games to its stable: Carcassonne, Alhambra, and the above-mentioned Settlers of Catan. There aren't a lot of details available yet, but it sounds promising. 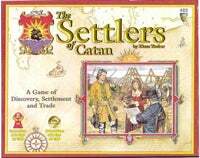 I know a computer version of Settlers has been in the works for some time, but I'm not sure that it's seen the light of day yet. Whether or not they'll be able to recreate the fun of the board-gaming experience over a network connection remains to be seen, but I'm certainly game. Ha ha.